The Insitute has decided that the domain of the Henri Wheaton Prize concerns “The Protection of the Environment and International Law“. The deadline for submission of your manuscript is 31 December 2018. For more information about the Henri Wheaton Prize, please consult the flyer. The Prize Award Regulations were established already in 1931 and now include several amendments adopted since. The current version was approved on 1 January 2018. 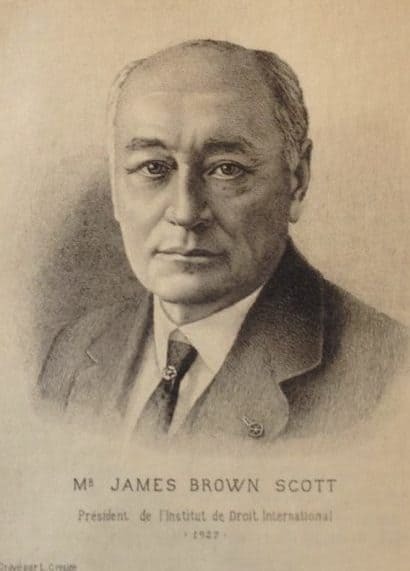 A particularly distinguished American lawyer, James Brown Scott, was born in 1866, studied at Harvard, Berlin, Heidelberg and Paris and went on to teach international law over the course of a remarkable University career. In particular, he created the Los Angeles Law School, was Dean of the Law Faculty of the University of Illinois and Professor at Columbia University. His talents were such that he was appointed Solicitor at the State Department of the United States. He was also a delegate of his country at important international conferences, including the Second Hague Peace Conference (1907) and the Paris Peace Conference (1919). For several decades he held the position of Secretary General of the Carnegie Endowment for International Peace. Elected in 1908 an Associate of the Institute of International Law, he became in 1910 a regular Member. Quite exceptionally he was called upon twice to preside over the Institute, which he would do at the Lausanne (1927) and New York (1929) Sessions. It was in 1931 that J.B. Scott inaugurated the prize. In the spirit of recognition towards the Institute and in a feeling of heartfelt homage to the memory of his mother, Jeannette Scott, who had had a constant influence on his life (Institute Yearbook, 1931, vol. II. p. 229). During his lifetime, he looked after the awarding of the prize in person. He passed away in 1943 and bequeathed to the Institute, in memory of his mother and sister, a sum of capital, the interest of which enables the regular disbursement of the prizes. The prizes bear each time the name of a distinguished jurist, on the basis of a list elaborated for the initiator of the prize, namely Andrès Bello, Carlos Calvo, Grotius, Francis Lieber, Frédéric de Martens, Mancini, Samuel Pufendorf, Louis Renault, G. Rolin-Jaequemyns, Emer de Vattel, Vitoria, John Westlake, Henri Wheaton. Applications for the John Westlake Prize on ‘Dispute Settlement before International Courts and Tribunals’ are now closed. The Institute wishes to express its gratitude to all persons who have participated in this competition. However, the John Westlake Prize has not been awarded during the 78th session in Hyderabad. 1933 John Westlake On demande une étude sur les règles applicables, en cas de responsabilité internationale, à l’évaluation de dommages causés à des particuliers sur le territoire d’un État étranger.